For the tomato sauce, peel and finely slice the garlic, then fry in a good amount of olive oil until lightly coloured. Pick and tear the basil leaves, then add to the pan with the tomatoes. Using the back of a wooden spoon, mush and squash the tomatoes as much as you can. Season to taste. As soon as it comes to the boil, remove the pan from the heat. Strain the sauce through a coarse sieve into a bowl, using the spoon to push any larger bits of tomato through. Discard the basil and garlic left in the sieve, but scrape any tomatoey goodness off the back of the sieve into the bowl. Pour the sauce back into the pan, bring to the boil, then lower the heat and simmer for 5 minutes. Cook until it’s the perfect consistency for spreading on your pizza bases. For the pizza dough, sieve the flour and salt onto a clean work surface and make a well in the middle. In a jug, mix the yeast, sugar and olive oil into 650ml lukewarm water and leave for a few minutes, then pour into the well. Using a fork, bring the flour in gradually from the sides and swirl it into the liquid. When it all starts to come together, work the rest of the flour in with your clean hands. Knead until you have a smooth, springy dough. Place the ball of dough in a large flour-dusted bowl and cover with a damp cloth and place in a warm room for an hour until the dough has doubled in size. Timing-wise, it’s a good idea to roll the pizza bases out about 15 to 20 minutes before you want to cook them. Stack the pizza bases, with a square of oiled tin foil between each one, cover them with clingfilm, and pop them into the fridge. Now’s the time to get your wood-fired oven, or conventional oven, heated up to full whack. Place a couple of heavy baking trays in the oven to heat up, too. Meanwhile, click off the broccoli florets and roughly chop (using the stalk, too). Blanch in boiled salted water for 1 to 2 minutes, then drain. Tear the anchovies into small pieces, then deseed and finely chop the chilli. Squeeze the sausage meat out of their skins, then roll into small, rough meatballs. 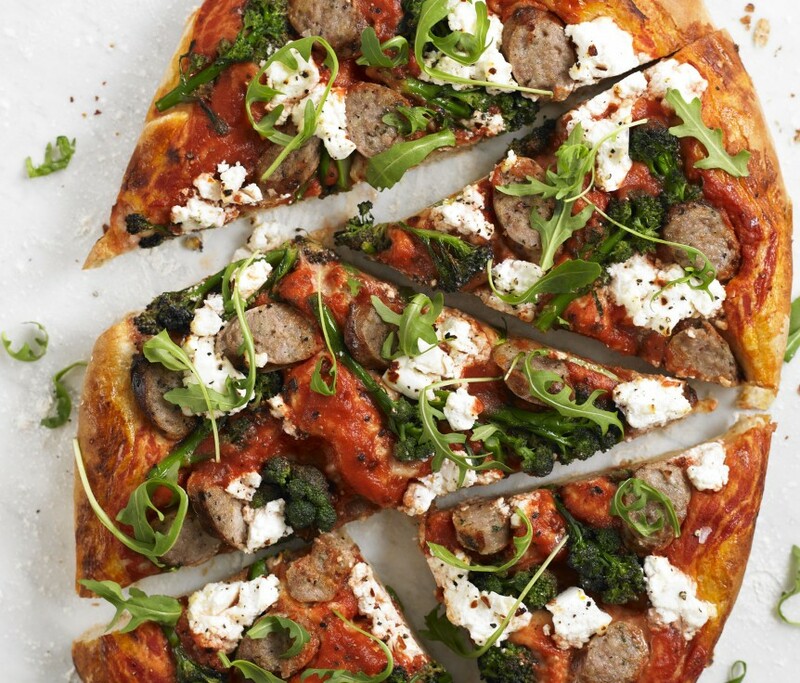 When you’re ready to assemble your pizzas, remove a tray from the oven, put a pizza base on it and assemble it quickly – smear tomato sauce on the base and dot with broccoli, torn up anchovy fillets and sausage meatballs. Tear over the Taleggio cheese and sprinkle with chilli. Crush and scatter over the fennel seeds. Place in the oven immediately while you prepare the remaining pizzas. If you’re using a wood-fired oven the pizzas should cook, one by one, in about 3 to 4 minutes – you want them to be puffed up, crispy and delicious. In a regular oven, they’ll take 8 to 10 minutes. Serve hot.